Tomorrow is the centennial anniversary of the opening ceremony for the massive Los Angeles Aqueduct, which delivered water from the Owens River in eastern California to the Los Angeles region over a 220-plus mile system of finely engineered tunnels, channels, pipes, pumps, reservoirs and other elements in a scheme that was filled with controversy, but was also one of the great engineering marvels of its time. William Mulholland, ca. 1910s. From the Special Collections division, University of Southern California library. Click on any photo to see it enlarged in a new window. From the time the source was located in 1904 and the land purchased to the sale of bonds to finance the project to the beginning of construction in 1908 and the five-year work to build the aqueduct with the labor of some 5,000 men to the dedication on 5 November 1913, one of the key players involved was Chief Engineer William Mulholland. At the time of the Aqueduct's opening, Mulholland was a resident of Boyle Heights, where he lived for about a quarter century. Although much has been written about the man and his work, a little background might be in order. 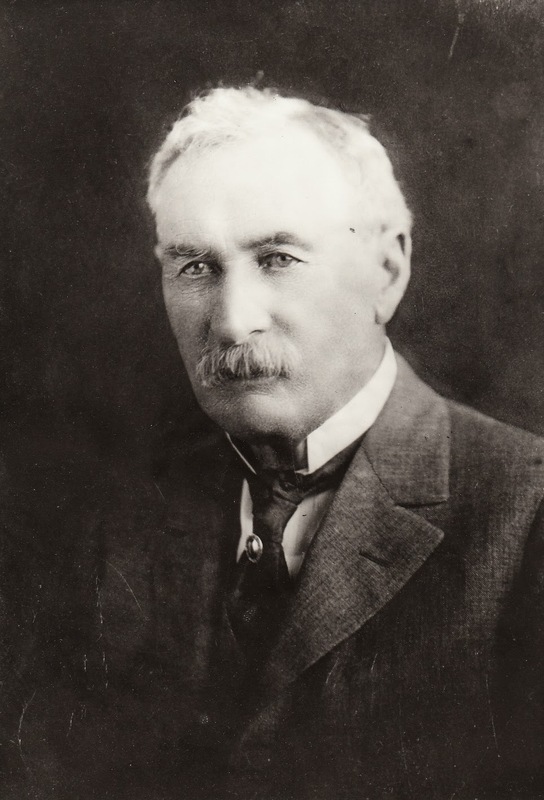 William Mulholland was born in Belfast, Ireland in 1855 to royal mail guard Hugh Mulholland and Ellen Deakers, who died when her son was seven years old, not long after the family relocated to Dublin. Ireland had been through decades of famine and political, economic and social unrest and, with little there to provide a basis for his future, William joined the British Merchant Marine while in his mid-teens and served in it for four years. Mulholland in the field with surveying equipment, ca. 1920s. From the Special Collections division, University of Southern California library. In June 1874, Mulholland landed in New York and worked on a Great Lakes ship and then a Michigan lumber camp, where he nearly lost a leg after an accident. Migrating to Cincinnati, he took to the road with a mechanic who specialized in sharpening scissors and fixing clocks. Meantime, his younger brother Hugh, who was sent to serve in the British Navy by his father, abandoned his post and somehow located William. In fall 1875, they arrived unannounced at the home of their mother's brother, a prosperous merchant in Pittsburgh, and they starting working at the business. A tuberculosis epidemic erupted in the Deakers household, however, and, after some children in the family died, a group decided to leave for California in late 1876, including William and Hugh, who were, apparently, stowaways on the ship leaving New York. At the Isthmus of Panama, though, the two were detected and ejected, forcing them to make the difficult fifty-mile trek across to the Pacific side. From there, they joined a Peruvian vessel to Acapulco and then another ship conveyed them to San Francisco. From there, they rode by horse the long trek to Los Angeles, where, in January 1877, they found the remaining members of the Deakers family, some more having died of typhoid. 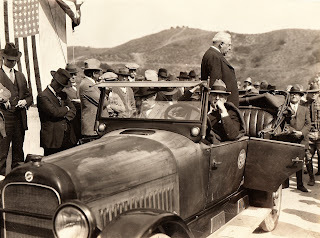 Mulholland in the front passenger seat of a City of Los Angeles vehicle at an unidentified event, 1920s. From the Workman and Temple Family Homestead Museum, City of Industry. Mulholland was not overly impressed by the small town he encountered and headed to San Pedro to find a ship on which to work. He was stopped on the way down by Manuel Dominguez, owner of the Rancho San Pedro, who hired the young man to dig artesian wells, Mulholland's first entre into working with water and the motivation for his future career as a water engineer. After that, however, the Mulholland brothers went to prospect for gold in the Territory of Arizona, but news of the famed Apache chief Geronimo convinced them to return to Los Angeles. The next year, 1878, William took a job as a deputy zanjero, tending the main supply ditch for the privately-held Los Angeles City Water Company at a spot several miles north of downtown and remained in the position for a couple of years. In the 1880 census for the San Fernando Township, which covered the area, he was listed simply as "W. Mulholland," age 24, and his occupation merely given as "laborer." A detail from the 1880 census at the San Fernando Township showing "W. Mulholland," as a "laborer," though he was then an assistant zanjero for the privately-held Los Angeles City Water Company. From Ancestry.com. Click on any photo to see it enlarged in a new window. One interesting anecdote had to do with a man calling out to Mulholland as he worked hard at cleaning out a ditch and receiving the curt reply, "None of your damn business," at which a fellow employee let Mulholland know he had just cursed out the water company's president William Hayes Perry, whose mansion was built in the new community of Boyle Heights in 1876 (and which is now at Heritage Square Museum near Highland Park.) Prepared to be fired, Mulholland was surprised to receive a promotion to foreman. Mulholland and Frederick Eaton, a hydraulic engineer for the company, became close associates friends, though there was a falling-out later, and their partnership proved essential in the Los Angeles Aqueduct project. Mulholland essentially was self-taught in the profession and was a voracious reader, taking in materials that aided his future work. Detail from the 1900 census showing the Mulholland family at their house, built in 1894, at "Cor. Cummings & 6th" in Boyle Heights. From Ancestry.com. 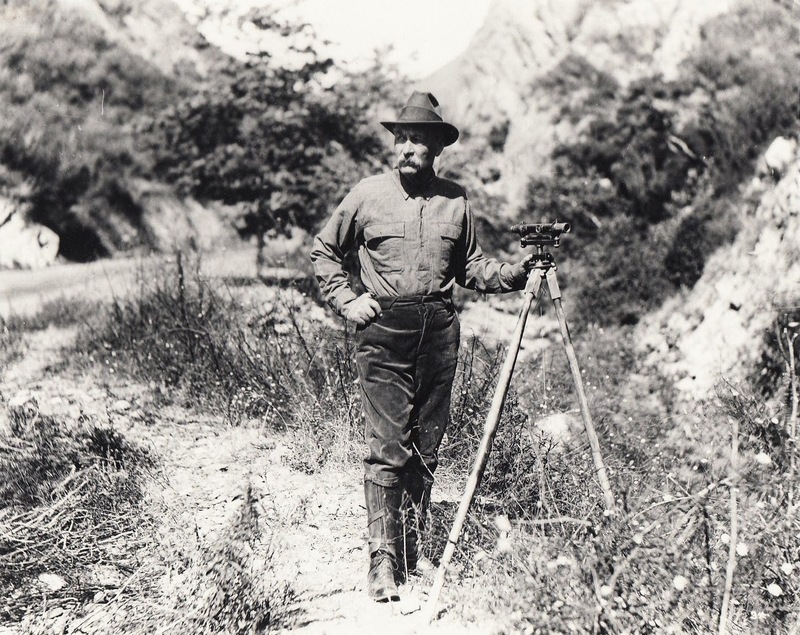 Through the 1880s and 1890s, Mulholland rose up the ranks of the water company and also was naturalized an American citizen in 1886, at which time the Los Angeles City Directory listed him as a "contractor in tunneling." By the end of that year, though, he became the water works superintendent, a position he held for several years, while the water company grew by acquiring other smaller firms and establishing a subsidiary, the Crystal Springs Land and Water Company near today's Griffith Park. In 1898, the thirty-year agreement the city of Los Angeles signed with the Los Angeles City Water Company expired. That year, Fred Eaton was elected mayor of the city and served a single two-year term, during which the battle over whether city water should be privately or publicly managed continued. When the private company finally agreed to sell to the city, new city treasurer, William H. Workman, who subdivided Boyle Heights with partners Isaias W. Hellman and John Lazzarovich in 1875 and was mayor of Los Angeles in 1887 and 1888, went to New York with the city attorney to sell the bonds to pay for the acquisition, which totaled $2 million. All thirty-one of the old company's workers were kept on as city employees, including Mulholland, who became superintendent. Detail from the 1910 census for the Mulholland family at Boyle Heights. From Ancestry.com. Click on any photo to see it enlarged in a new window. Although the Los Angeles Aqueduct was clearly Mulholland's most notable project, he was involved a host of others as growth in the region skyrocketed into the 1920s. These included the planning stages for the massive Boulder Dam project on the Colorado River and dealing with sabotage and other acts of resistance from folks in Owens Valley against the aqueduct. Throughout the period, Mulholland's position as superintendent of the water department gave him a national prominence and stature, commemorated when a new scenic highway built along the ridges of the Santa Monica Mountains was named for him when it opened in 1926. It was a position and prestige he held until the devastating St. Francis Dam disaster in 1928, in which a dam near modern Santa Clarita and engineered under Mulholland's leadership failed, with the resulting flood killed several hundred people in Ventura County. Mulholland, who was in his early seventies and was bewildered by the tragedy, resigned and the new Department of Water and Power (DWP) took on new leadership under Harvey Van Norman, whose name now graces the main reservoir that receives Los Angeles Aqueduct water. Mulholland died in July 1935 at the age of 79 with his body lying in state at city hall and thousands passing by his casket to pay their respects. As for Mulholland's 25 years in Boyle Heights, not much is said at all in the exhaustive biography of the man, published in 2000, by his granddaughter Catherine. She did note that the engineer and his family moved to the neighborhood in 1894 and their residence was in a fashionable part of the community at the northwest corner of Cummings and 6th streets and had a fine view of Hollenbeck Park. Near neighbors included Elizabeth Hollenbeck, whose estate is now the Hollenbeck Palms senior residential community; the former house of Mamie Perry Davis, whose father was Mulholland's boss at the Los Angeles Water Company; and William H. Workman, who was mentioned above. The Los Angeles Times of 19 May 1894 noted that a building permit was issued to Mulholland for a "cottage, northwest corner Sixth and Cummings, $3000." That amount may sound paltry to modern ears, but it was a sizable sum for a residence of the era, especially one mired in a serious national depression which erupted the previous year. Beyond that, the house did not evidently get mentioned again in that paper before the Mulholland's left for a new residence west of downtown in 1920. Census listings for 1900, 1910 and 1920, though, do list the family at their Boyle Heights house. The first of these, taken on 7 June, shows the family as living at "Cor. Cummings & 6th." The household consisted of the 44-year old civil engineer and his 32-year old wife, the former Lillie Ferguson, who had been married 9 years (their tenth anniversary was later in the year) and their five children, three daughters and two sons, ranging from two to eight years old. A decade later, on 20 April 1910, the address was still given as "Cummings cor. 6th" and Mulholland was shown as "Civil Engineer City W. Works." He and his wife were shown as having had six children, but five surviving, whereas in 1900 there were five children, all alive, there being a son who died at the age of two in 1905. The 1920 enumeration was taken at the beginning of the year and the 64-year old Mulholland, again listed as "Civil Engineer," was a widower, his wife having died five years previously of cancer. Three of his children were with him. Soon, however, the family relocated to a home on St. Andrews Place, west of Western Avenue and north of Wilshire Boulevard and the 1930 census recorded the value of the home as $30,000, indicating that the home was substantial. Notably, the Boyle Heights house was razed in the 1950s when the controversial construction of freeways, in this case interstates 5 and 10, were built through the neighborhood. Not long afterward, the St. Andrews house was bulldozed when that street was converted to rows of apartment buildings. William Mulholland was one of the most prominent individuals in Los Angeles during about three decades of explosive and controversial growth from 1900 to 1930. From humble circumstances in a ravaged Ireland he emigrated to America and roved the country for several years before finding himself digging an artesian well on one of the last remaining Spanish and Mexican-era ranchos, which launched his career, largely self-taught, in water engineering. With the epic Los Angeles Aqueduct and other projects, he established a legacy of public works building with few rivals in American history, but it was tarnished by the disaster of the St. Francis Dam failure in 1928. While much has been written about this remarkable man, but it has not often been noted that he was a resident of Boyle Heights for some twenty-five years from 1894 to 1920. With all the commemoration of the 100th anniversary of the opening of the aqueduct, Mulholland's place in Boyle Heights history should also be remembered. Catherine Mulholland, William Mulholland and the Rise of Los Angeles (Berkeley: University of California Press,) 2000. Margaret Leslie Davis, Rivers in the Desert: William Mulholland and the Inventing of Los Angeles (New York: HarperCollins Publishers,) 1993. Charles F. Outland, Man-Made Disaster: The Story of St. Francis Dam (Spokane: The Arthur H. Clark Company,) 2002 (1963, 1977). Doyce B. Nunis, Jr., ed., The St. Francis Dam Disaster Revisited (Los Angeles: Historical Society of Southern California; Ventura: Ventura County Museum of History & Art), 1995. Contribution by Paul R. Spitzzeri, Assistant Director, Workman and Temple Family Homestead Museum, City of Industry, with thanks to past Boyle Heights Historical Society president Malissa Strong for suggesting this topic.